The Piraeus Bank Group Cultural Foundation (PIOP), the Jewish Museum of Greece and the Jewish Community of Ioanninaare pleased to announce that they are holding a joint periodic exhibition, “WHEN ART IS SACRED: Jewish heirlooms from Ioannina”, at the Silversmithing Museum, Ioannina. The exhibition, which opened on Tuesday, 19 September and runs until 11 January 2018, includes high-quality heirlooms of the Romaniote (i.e. Greek-speaking) Jews of Ioannina. The exhibits, which date from the 17th to early 20th centuries, testify, among other things, to the close connection between the silversmithing of the Jews and their religious ceremonies, whether they were performed by the congregation or by the family at home. The exhibition is divided in five sections, starting from the interpretation of the term “Jewish art” and how it is part of the devotional habits of Judaism. 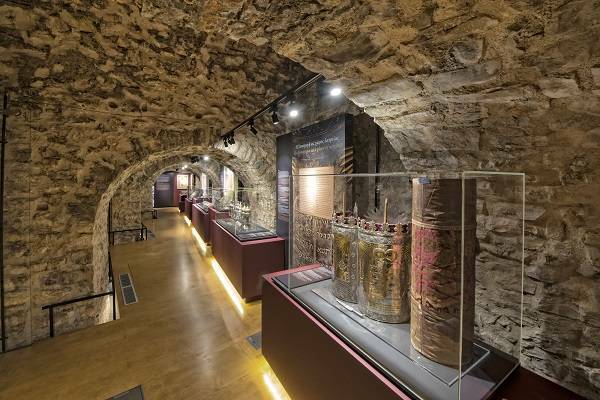 The second section presents the synagogue, which, as a place for group prayer and study, is one the most important Jewish religious institutions, with special reference to the synagogues of Ioannina. The third and fourth sections refer to the Jewish calendar and life cycle, respectively. In the last section, texts, archival photographs and audiovisual material highlight both the historical context and the long-standing presence of Romaniote Jews in Greece since the Hellenistic era, as well as the course of the Jewish community of Ioannina, which flourished in particular during the 19th century. The Jews of the city actively participated in local social and political life after the Ioannina became part of the Greek state in 1913. They lived in harmony with their Christian fellow citizens, while maintaining their own traditions and identity. Visitors have the opportunity to see artefacts, both silver and non-silver, associated with religious ceremonies, such as the Tik, with a silver and partially gold-plated case (where the Sefer Torah, the sacred book of Judaism) is kept; the Mappah (a square piece of silk fabric in which the Tik is often wrapped); the silver Rimmonim (the finials of the Sefer Torah); the silver Shaddayah (dedicatory plaques dedicated to the memory of deceased family members or to the health and well-being of the living); the silver Hanukkiah (the eight-candle lamp to commemorate Hanukkah); as well as examples of the famous silver Megillah (Book of Esther) of Ioannina. There are also silver objects used in the rite of circumcision, a velvet cushion cover for the newborn, the Alef (a wall-mounted talisman and circumcision certificate) and the Ketubah (a marriage contract, which includes the obligations of the groom and the bride, as well as the monetary value of the dowry). The exhibits come from the collection of the Jewish Museum of Greece, from the Jewish Community of Ioannina and from the private collection of Mr Rafail Mousis. “WHEN ART IS SACRED: Jewish heirlooms from Ioannina” is the second of a three-part exhibition under the general title “When art becomes sacred”. The first, with brilliant samples of Epiriot church silversmiths, attracted more than 18,000 visitors to the Silversmithing Museum.